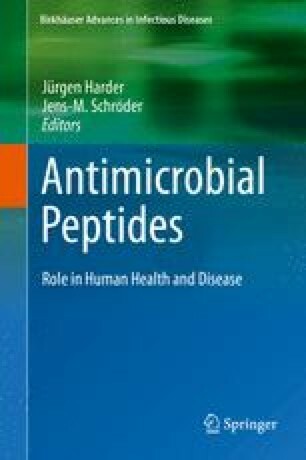 Antimicrobial peptides are well known for their important roles in host defense by enhancing the barrier function and limiting microbial populations of the skin and mucosa. However, many of these peptides are now known to have additional roles assisting innate and adaptive immune functions. To facilitate innate immunity, antimicrobial peptides activate complement, chemoattract cells (e.g., monocytes, macrophages, T cells, neutrophils, immature dendritic cells, and mast cells), enhance phagocytosis, and modulate the production of chemokines and proinflammatory cytokines in other cells. At local sites of initiation, antimicrobial peptides can act as opsonins to enhance phagocytosis by monocytes and phagocytes and can activate cells. In the latter, for example, treatment of osteoblasts and osteoblast-like MG63 cells with human beta-defensin (HBD)2 increases their proliferation rates. Treatment of osteoblast-like MG63 cells with HBD2 and HBD3 increases transcript levels of osteogenic markers for differentiation, increases antileukoprotease (ALP) levels, and enhances mineralized nodule formation. To facilitate adaptive immunity, antimicrobial peptides assist the uptake of antigens by monocytes or other antigen-presenting cells and later direct the process toward a Th1 or Th2 adaptive immune response. More commonly though, antimicrobial peptides induce a mixed response characterized by Th1-/Th2-specific antibodies and Th1/Th2 cytokines from antigen-exposed splenocytes of immunized animals. Finally, antimicrobial peptides can be detected in the margins around both oral and cutaneous wounds, and there is growing evidence to suggest they also play a dynamic role in wound healing by improving wound angiogenesis, vascularization, and reepithelialization.